Graeme McDowell was made an MBE (Member of the Order of the British Empire) while Monty holds an OBE but still awaits a knighting. I only know this from checking his Wikipedia page, which, one might surmise has been vandalized. Paging IMG London interns! Apparently Cathay Pacific Airlines has a thing against U.S. Open trophies. Get Your 2010 Merchandise At The Prices It Should Have Been Sold At In The First Place! Several USGA members have forwarded the email alerting them to the fire sale on this year's must-not have stuff from Pebble Beach, where a boring logo, boring products and bloated prices set by the Pebble Beach Company encouraged fans to buy less. So do your part to help the Pebble Beach Company and take some of this stuff off their hands. Not to beat a dead golf hole, but I just loved this effort by the art department (a.k.a. 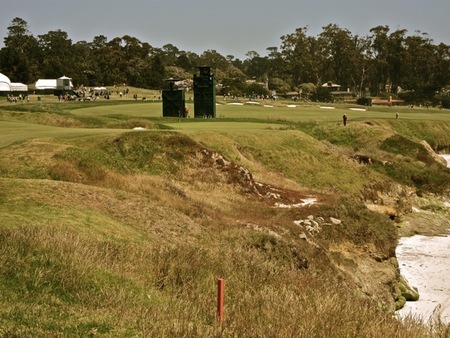 Tom Naccarato) to show us how much the fronting bunker at Pebble Beach's controversial 17th has eaten into the green. You may recall I detailed the issues here in this story and video. 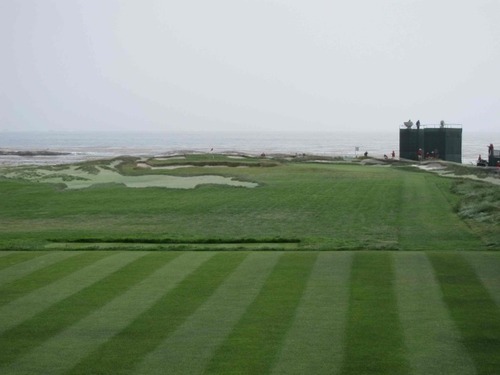 "Beauty In Eye Of Beholder﻿"
A week after the U.S. Open, there is still quite a bit of conjecture about the greens at Pebble Beach. The USGA's Pat Gross writes this defense at USGA.org. The question I keep hearing relates to firmness and why they couldn't have softened the greens just a bit. And while I certainly can see that response, there is another large audience that would howl with horror at the notion of artificially softening the greens. 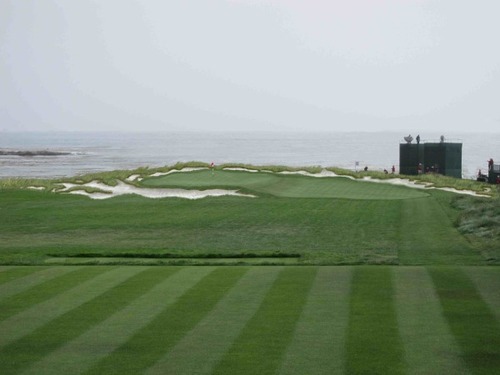 But when the greens have shrunken so much and are in a sense dysfunctional architecturally when combined with major championshp conditions, maybe that is the answer. But either way, the USGA can't win. Nice reporting by Daniel Lopez in the Monterey County Herald to reveal the finger pointing over who asked a banner plane to move along, particularly since the FBI is getting the blame and denying they'd do such a thing. 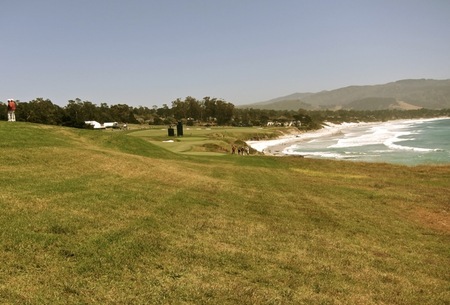 Pebble's Double Fairway 9th Could Be Restored! I understand if you have Pebble Beach fatigue by now, but come on, it beats talking about the Traveler's Championship, no? 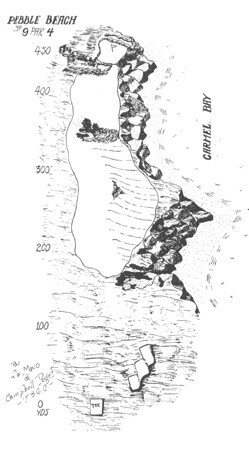 Anyway, for years I've been told by Pebble Beach Company folks that the old alternate fairway on the 9th fairway, created by Chandler Egan in the 1928 redo along with a shift of the 9th green toward the cliffs, was not possible because of cliff erosion. Last week I wandered over to the now abandoned fairway and of course, there is plenty of space for the fairway and it provides the optimum angle to attack hole locations cut behind the gaping left bunker. Having been fortunate enough to be there, I have my take on Pebble Beach as presented by superintendent Chris Dalhammer: quite good considering the hand he's dealt and very much in line with past Opens. 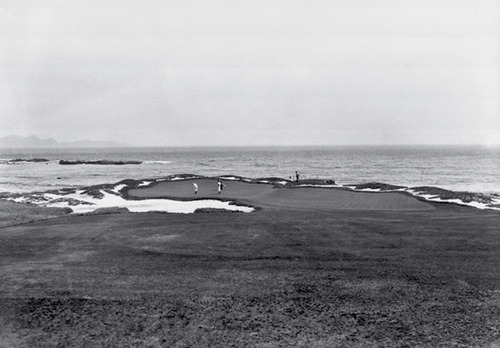 My Golf World analysis of Pebble Beach's design issues and the dilemma of making repairs is now posted at GolfDigest.com. 2010 U.S. Open Third Question: Why The 2019 Announcement Now? 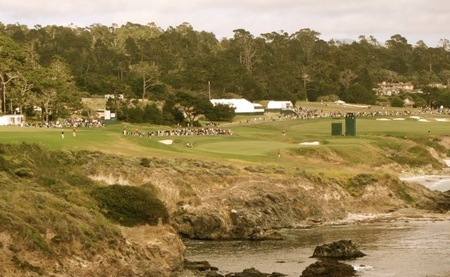 I know it was a week ago, but a lot of people are still scratching their heads over the USGA's decision to announce the execution of a "letter of intent" to return to Pebble Beach in 2019. The emails I've received have mostly focused on the oddity of committing so far in advance and most of all, upstaging the 2017 Erin Hills announcement. Pebble The Permanent Host? I Think Not. Tim Rosaforte and I debate this notion for GolfDigest.com. Spare me the jacket one-liners, I already heard plenty of not-very-clever one-liners from that international house of fashion sense known as the media center. 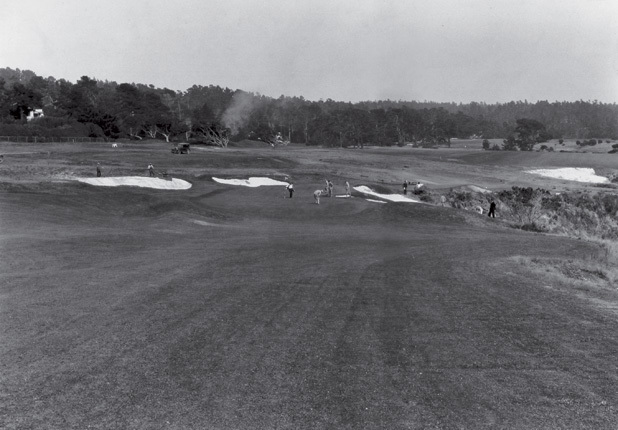 Alister MacKenzie renovated the 8th green in 1926 as part of an audition for the greater overhaul that was handled by Chander Egan, Robert Hunter and Roger Lapham. 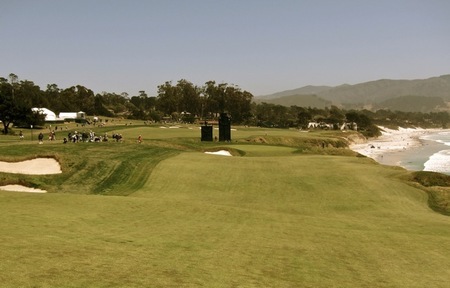 Here is an early view of MacKenzie's green, with the 2010 US Open perspective showing two added bunkers. I'm not sure who added them, but something tells me it was Robert Trent Jones. And I think he made the right choice. Todd Milles features all of Ryan Moore's post round tirade Sunday, and the only part I would agree with is his point on the 17th. Warning, yours truly doing video on camera here. Make sure to not sit too closely to the screen. A Sale At The Pebble Beach Company Store! Driving home today after finally caving and buying a few items at Monday's 50% off sale, it occurred to me just how badly bungled the U.S. Open merchandise selection and pricing was. Though it was delightful to hear from sales reps that numbers were at 50% of the budgeted sales figures through Friday. The public does have limits. Let's hope that in the USGA contract with the Pebble Beach Company for 2019 that the blue coats take control of the shop to ensure better stuff and pricing that fans have grown accustomed to. Of course, the 50% off prices still felt like retail prices...in the real world. "We are living through a golden era for Irish golf." Karl MacGinty on Graeme McDowell and Irish golf. 2010 U.S. Open Second Question: "The Human Vuvuzela"
Mercifully my AmEx television battery died out from excessive use on Thursday and Friday, so I missed out on Chris Berman's first ground control to major Toms, but boy did I hear from folks on Twitter and via email.